Over in Auckland where I’m based at present, there are very few Jura wines available, in fact there are very few French wines from the smaller appellations. It is not surprising really with such a tiny population and such an important wine production in its own country. It’s worth remembering that only ten years ago, there were hardly any Jura wines to be found anywhere outside the Franche-Comté region. Even Paris had little choice. However, Auckland has one specialist French importer and retailer, Maison Vauron, who does wave the flag for the Jura, having imported a few wines from Stéphane Tissot for several years. I went to see them recently and they told me that they were thinking about adding one more Jura producer to their range and asked me what I thought about Domaine Buronfosse, as one of the partners had been particularly impressed with a Savagnin Ouillé from them. Based in the far south of the region, in the Sud Revermont – an area best known for its white wines – located in the same hamlet as Domaine Ganevat, Peggy Buronfosse has been quietly building up her wine estate and now her husband Jean-Pascal has joined her. Their reputation for white wines has grown considerably and I find it really exciting that some of their wines will arrive in New Zealand soon. So, here is the next producer profile excerpt from the book – you have bought the book, haven’t you?? You won’t find the book on Amazon.com (only on Amazon.co.uk) because I couldn’t stand giving them the huge commission they require. But in case you need it you will find the Jura Wine book stockists on this page, along with a few reviews. Peggy Buronfosse cannot quite get over the fact that her wines are available in trendy New York wine shops and restaurants. She embraces it, but is humble at the same time. Neither she nor her husband Jean-Pascal set out to be vignerons, but they did fervently wish to put down roots and farm somewhere. They landed in the sleepy hamlet of La Combe below Rotalier. Originally from the cities of Lyon and St-Etienne, today whatever this couple do, together with their children, is a lifestyle choice, and however hard the work is they seem to love the various aspects of producing wine. Both Peggy and Jean-Pascal trained in agriculture and their plan was simply to find jobs, keep some animals, have a vegetable garden and source as much of their own food as possible while bringing up their family. Jean-Pascal worked as a teacher in the Lons agricultural college, and vivacious Peggy (or ‘La Peggy’ as she’s known locally) worked in the vineyards for Domaine Joly and got to know her neighbour Jean-François Ganevat. The vine bug hit her and in 2000 Raymond Pageault, an 80-year-old local vigneron who had heard about her, decided that ‘La Peggy’ was the one to take over his steep vineyards. He persuaded the couple to rent his parcels of old vines and their challenge started. Although originally Peggy had to use herbicide, that soon changed and she started, with Jean-Pascal’s help, hoeing the vineyards by hand with the aim of being completely organic. Official conversion started in 2007. Now, having taken on a few more vineyards, they have plots predominating in marl, limestone and schist, mainly in Rotalier and St-Laurent de Grandvaux. To fulfil a long-held wish, they are making plans to get a horse for the family and hope to train it to work in the vineyards. After a struggle at the start, by the 2004 vintage they were beginning to find private clients through wine shows and wine clubs, and the media began to notice as well. Typically for the Sud Revermont, the emphasis is on whites, but inspired more by Ganevat and Labet than by Joly – the modern Rotalier–Burgundian style. They have several stylish ouillé Chardonnay cuvées, all distinctly different according to their terroir, plus a blend, Belemnites, and a tangy Savagnin ouillé called Entre-Deux; all spend around 18 months in barrel. A first Jaune was released in 2005, there is a tiny amount of red and an exquisite non-approved Vin de Paille named Epicure. Latterly a beautifully pure Chardonnay Crémant has been added to the range. This is a venture that remains small and will continue to be so. 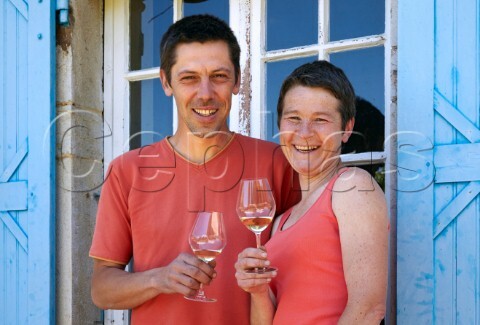 Although Jean-Pascal gave up his teaching job in 2013 and joined Peggy to work on the domaine, they have no wish to expand the vineyards beyond around 4ha. Their beautiful labels are from paintings by Jean-Pascal’s brother-in-law and reflect the wines and the terroir. These are smiling, thinking people and it shines through in their wines.